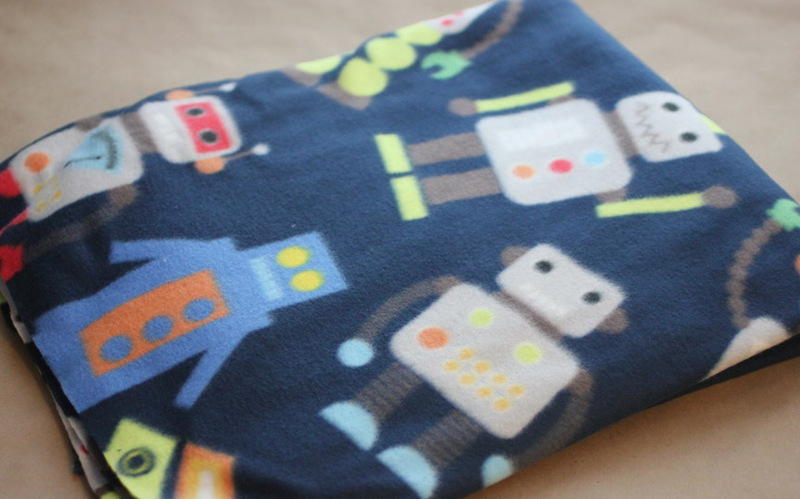 I’ve had visions of a robot lovely blanket ever since I saw this adorable robot fabric at Hobby Lobby. This will be the third lovely blanket I have designed so for a more detailed tutorial, please see the first one I created: Monster Lovey Blanket. Chain 16, SC in 2nd ch from hook and rest of way down. Continue to SC on other side of chain. Do not join, begin to SC in rounds for a total of 12 rounds. Fasten off but wait to stuff and close until you attach the face, ears, safety eyes and antenna. Magic ring, 6 SC in ring, continue to SC in rounds. Fasten off, stuff lightly and sew closed. Use tapestry needle to stitch onto sides of head. Row 2 – 6: SC across, ch 1, turn. At end of round 6, continue to SC around sides and join to first SC. Fasten off leaving long tail to sew onto head. Magic ring, 6 SC in magic ring, continue to SC in rounds. Stuff lightly if needed and sew bottom closed. Use tapestry needle to stitch onto top of head. Magic ring, SC 8 in ring, continue to SC in rounds. Round 6: SC decrease, SC in next 2 stitches, repeat around. Stuff head and limbs and sew closed. Use your tapestry needle to stitch onto sides of the fleece blanket after you crochet around the edges of it. Cut a 10.5 x 12 piece of the fleece fabric. I created holes to crochet through with a skip stitch blade and a ruler as a guide. Holes should be made about a 1/2 inch from the edge. It is also helpful to cut the corners into rounded corners so it will lay down flat when you crochet the edge. I purchase my skip stitch blade from the Project Linus website but unfortunately it looks like it is no longer available there. 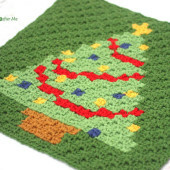 You can find the same one HERE on the Skip-Stitch website. I have the “original skip stitch blade” and you will need a Fiskars 45mm Contour Rotary Cutter which I purchased from Amazon. Crochet around the edge of the fleece by make a SC in each hole, chain 1, SC in next hole, repeating around. 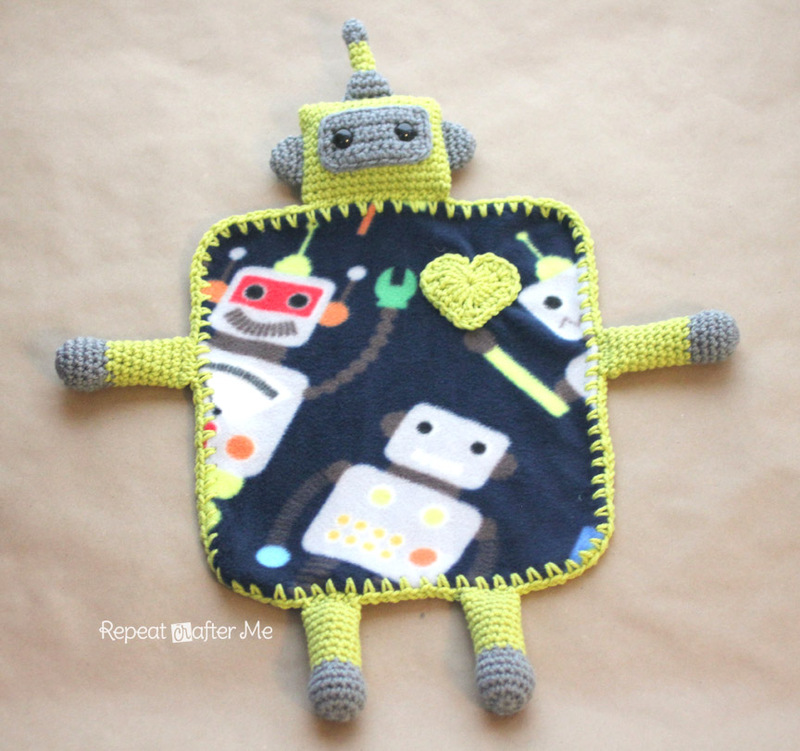 Add a crochet heart to turn your Robot into a Lovebot! Perfect for your little guy (or gal) for Valentine’s Day 🙂 I followed THIS free crochet heart pattern by Skip to my Lou. Using a sharp tapestry needle, stitch the heart onto the fleece fabric. This is really cute! 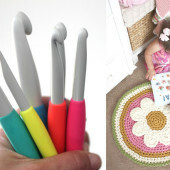 I wonder if the sharp crochet hook would have worked instead of the skip stitch blade? I've still not had time to try mine!! Unfortunately, the crochet hook will not work. It isn't sharp enough. I had to use a pair of sharp scissors and poke the holes through. The Sharp Crochet hook worked for me. I say give it a try. veramente carino, ed ha anche un cuore!! Sooooo cute!!!! I LOVE you stuff! I can't wait to see a little girl one! Very cute! !Would make a neat hot water bottle cover too. Wow. Good collection! Wow! These are nice photos! 🙂 Nature is really the best inspiration for art. I love this!!! So cute!! So freaking cute! 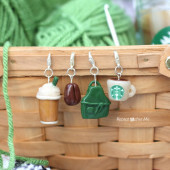 Thanks for sharing all your wonderful, creative goodies! Very cute. I love that he has a heart. oh my goodness, this is sooo cute. I saw this a craft gawker a few weeks ago and fell in love. 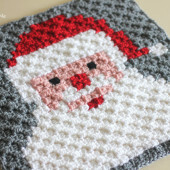 I wish i knew how to crochet! Loved seeing this at the special link party supporting Sandy Hook last week. Hope you'll come to The Humble Brag link party today to see some features from last week and link up some more cool projects. Happy Friday! This is just precious! I love the colors and that it's for a boy, since we've both got boys. Hope you had a wonderful Christmas, Sarah! Thanks for sharing at Hookin On Hump Day! Is the fleece one or two ayers? I just found your blog through Pinterest, and I love it! I can;t wait to make a few loveys!. But, I wanted to give you a little chuckle too. My 3 yr old DD saw you photo and is insisting you are Sophia the First's Mommy. I realize with two boys you may not know about Disney's newest princess, but my daughter is insisting you are Disney's newest queen! I bought a ergonomic tapered awl to make the holes. Basically a pointy craft tool to poke holes in leather and stuff. Duo you know hire far apart the holes should be from each other? I just wanted to say how cute this is. I am making it right now and have a couple of questions. 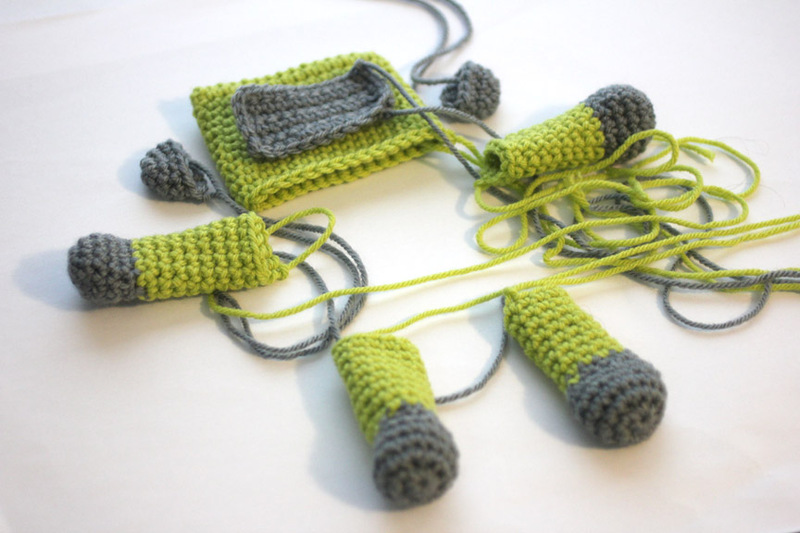 On the antenna it says to crochet rounds 1-3 with grey and rounds 3-6 with green. Should this read rounds 1-2 with grey and rounds 3-6 with green? Also I do not see any directions for legs so I am assuming the arms and legs are the same. I hope this is correct. Thanks for sharing such a great pattern. Hi! 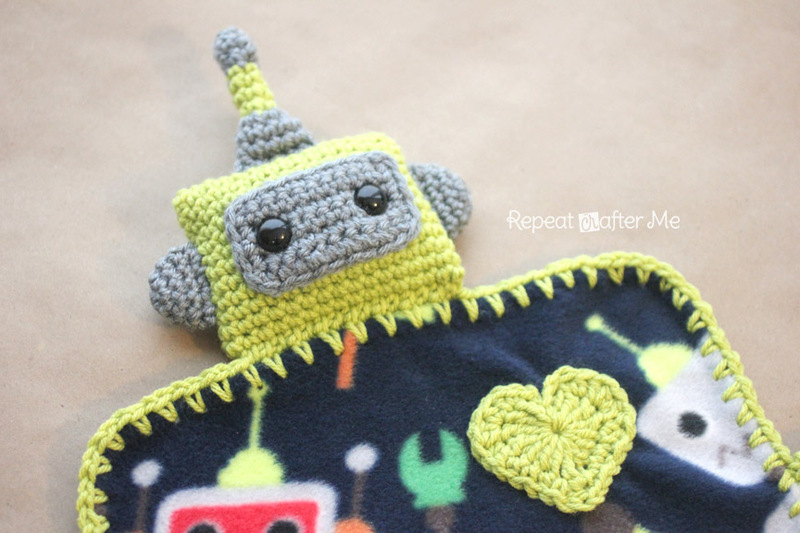 I love this pattern and just made three robot loveys for my baby. Couldn't find a nice fleecefabric in my local fabricshop so I went for a velourfabric instead. Thank you so much for this pattern and all the inspiration you share!! I just completed a slightly different version. Love this lovey! Thanks for making this pattern free. question, my boyfriend was saying this really isn’t a blanket that it is just the size of a piece of paper. what would you do if you want to make this a blanket to actually cover a child how can you adapt if you want it a little bigger. I can’t wait to try and make one of these.